The trail has been clipped and cleared, the equipment made ready, and all we need is a few feet of snow to get going. Thanks to the eleven club members who turned out to help with the trail clearing this year, your contribution is appreciated! If you’ve not skied at Colpoys before, here is what to expect as the season gets underway. Unlike the Sawmill trail which needs very little snow to get going, the limestone rocks at Colpoys require a foot of snow (at least) to allow us to safely operate the grooming equipment. The trail is first packed with the snowmobile to help establish a base and then we can start to set tracks on all or part of the trail where there is good coverage. 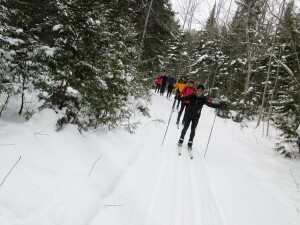 If you just like to get out and ski in the forest and field regardless of grooming, you can get out there as soon as the snow flies and make your way around the trails setting your own tracks as you go. The portable toilet is usually ordered as soon as we begin grooming, and it is best to consult the club website for up to date trail conditions if you intend to come out for a ski. We will try to groom whenever there is new snow and hopefully grooming will be complete by 10 am as long as the weather and snow conditions cooperate. I look forward to a great ski season and hope to see you out enjoying the trails.